Note: To complete these steps, you will need to know your email address and password provided by your Internet service provider (ISP). 2. Click the File tab. 3. In the Info category, click Account Settings, and then click Account Settings in the drop-down. 4. On the Email tab, click New. In the Your Name box, type your full name. In the Email Address box, type your e-mail address. Note: Your ISP provides this information. In the Password box, type the password that your ISP provided. In the Retype Password box, retype the password, and then click Next to begin the Auto Account Setup process. Outlook will then try to automatically configure your account. Some ISPs require the full email address to be entered into the User Name field. If you want Outlook to automatically enter your email password, make sure that the "Save this password in your password list check box is selected. If your account is successfully configured, the Add New Email Account dialog box indicates that the account is created successfully. Note: If the automatic configuration fails, the Auto Account Setup feature tries to connect by using a connection that is not encrypted. If this method also fails, then the account must be configured manually. 2. 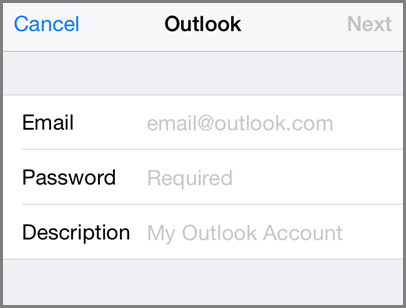 Type your full email address, for example @outlook.com, and your password, and then tap Next. 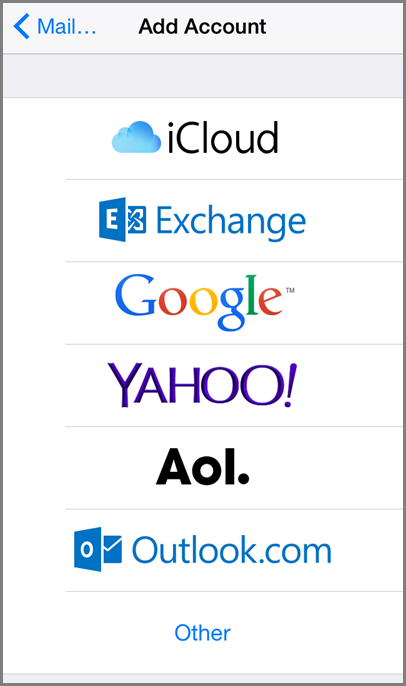 NOTE This can be an email account ending with @outlook.com, @hotmail.com, @msn.com, or @live.com, and includes international domains, such as @outlook.co.uk, or any custom domains hosted on Outlook.com. 3. 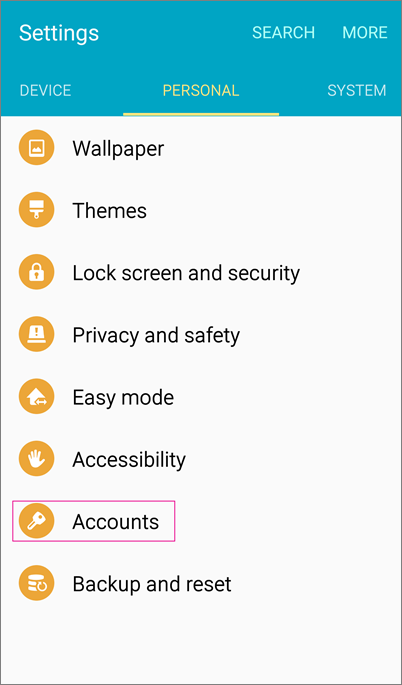 On the Account Options page, select the options for how you want to receive your mail, and if you also want to sync your calendar and contacts, and tasks, and then tap Next. 4. Give the account a name, and tap Done. 1. Tap Settings > Mail, Contacts, Calendars > Add Account. 2. In the Add Account page, tap Outlook.com. NOTE This includes international domains like @outlook.co.uk or any custom domains hosted on Outlook.com. 3. Enter your full email address and password, and then tap Next. 4. 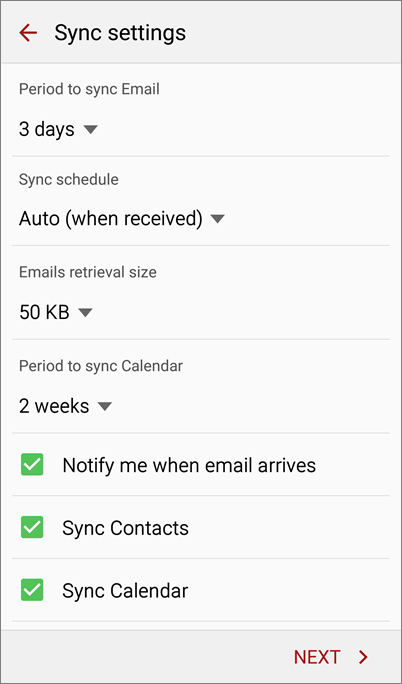 By default, Mail, Contacts, and Calendar information are synchronized. Tap Save. Not working? Make sure you entered your email and password correctly and try again. 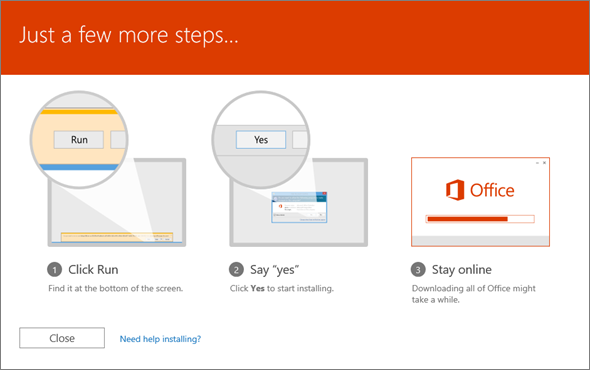 TIP In some situations, your goal might not be to install but to reinstall Office. For example, maybe you replaced a broken hard drive. IMPORTANT The process that installs Office 2016 also uninstalls all Office 2013 products. As you might expect, Word 2013, Excel 2013, and the rest of the Office suite are uninstalled. In addition, if a computer has InfoPath 2013, SharePoint Designer 2013, or certain versions of Visio 2013 or Project 2013 installed, installing Office 2016 also uninstalls those programs. You won’t be able to reinstall them. For more information, see "We need to remove some older apps" error. 1. Sign in to your My Account page, and choose Install. 2. If you want to install the 32-bit version, on the Install page, in the Install Information section, choose Install. Choose Language and install options, choose Additional install options, choose Office (64-bit), and then choose Install. For more information about choosing a version, see Choose the 32-bit or 64-bit version of Office. TIP If you don’t have any installs left, you can deactivate one. 3. Click Run or the equivalent depending on the browser you're using. 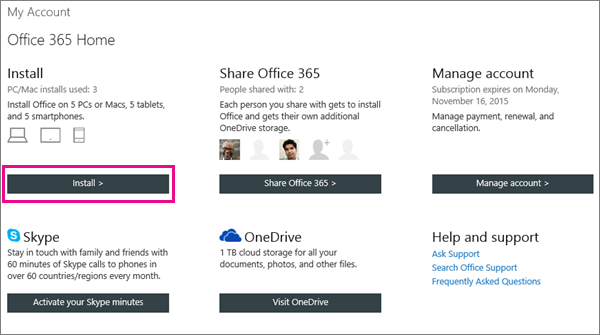 During the download process, you can watch a video to learn more about Office. 4. When you see "You're good to go", choose All done. TIP After installing, learn how to find the Office applications that you just installed. Some subscriptions allow you to install Office on more than one computer that you use. You just sign in with the same account and use the same installation procedures. So, for example, you can work on your laptop when you're portable and your desktop at home.